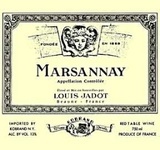 Maison Louis Jadot produce a deep coloured Marsannay. The subtle bouquet is reminiscent of blackberries, prunes and blackcurrants, while ageing lends them a musky odour. The wines are usually tannic and very supple. It will be a perfect accompaniment to roast, grilled or braised red meat. The 2014 Marsannay Villages has an expressive nose that captures the essence of Marsannay better than the Clos du Roy (at least at this early stage). It is adorned with attractive blueberry and cassis notes, all nicely defined and joyful. The palate is well balanced with supple, rounded tannin. This feels fleshy in the mouth, quite caressing with a gentle raspberry and dark plum finish interlaced with white pepper and sage. It leaves the mouth tingling with pleasure. Very fine.